02.08 Tony Abbott, the Australian prime minister, has made some comments about the news that the plane has been declared lost with all onboard. Speaking in Canberra, he said it has been a "desperately difficult time" for thousands of people, particularly in China and Malaysia. He said Australia would welcome the families of any of the victims that want to come to Australia as the search for the wreckage continues. 01.40 Here is the striking and sombre front page of the New Straits Times from today. CCTV is reporting live from the Lido hotel in Beijing this morning. That is where many furious and distraught Chinese relatives of Flight 370's missing passengers recieved the news last night that authorities believed nobody could possibly have survived. The CCTV reporter says families there are now already gathering to watch a live feed of this morning's scheduled press conference in Kuala Lumpur by Malaysia's Prime Minister. Some people are demanding the Malaysian ambassador comes to their hotel while others are already vowing to take "action" and receiving legal advice, CCTV says. 00.20 Warren Truss, Australia's deputy PM, has said that the Malaysian government will take over the investigation in the southern Indian Ocean for lost flight MH370, according to a report by Australian Associated Press. Mr Truss said confirmation by Malaysian Prime Minister Najib Razak that the plane had crashed killing all on board moved the investigation into a new phase, with Malaysia taking control under the Chicago Convention on international civil aviation. “The announcement by the Prime Minster that Malaysia believes that the aircraft is lost and that there will be no survivors does move the search to a new phase,” he said. “It moves it to a stage where we are now investigating an accident, a loss of an aircraft and some new decisions will have to be taken now about the direction of future operations. “Malaysia needs to take control under the Chicago convention of those investigations. Mr Truss said the HMAS Success had been in the area of ocean where sightings potentially related to MH370 had been made but officers had not recovered a single piece that might be associated with the aircraft. He said the Malaysian government's announcement was based purely on the satellite imagery and calculations available “so it’s really a long, long way away before much can be done by way of physical examination”. "It’s still important for us to try and find as much of the aircraft as possible. “The ideal would obviously be to locate as much of the wreckage as possible. “That will require sophisticated equipment, some of which we do not have in Australia. “It is also a priority to recover the flight box recorder on the aircraft. Australia’s Prime Minister Tony Abbott said Tuesday that a search of the southern Indian Ocean for possible debris from Malaysia Airlines Flight 370 would resume “as soon as possible” after poor weather grounded aircrews earlier Tuesday. Australia’s Defense Minister David Johnston said flying conditions had been declared unsafe, with a cold front bringing strong winds and ocean swells moving through the region over the next 12 hours. The Australian military vessel, HMAS Success, is traveling south to avoid the rough conditions. “Our condolences to the people of all of the countries who have lost friends , relatives, loved ones in the MH370 tragedy,” Mr. Abbott told reporters, promising to make welcome the families of people on the plane if they chose to go to Australia to await the recovery of any debris from the plane. Australia’s Defence Minister David Johnston said it wasn’t yet clear where any wreckage from Flight 370 would be processed by investigators. He expected that the recovery vessels would first return to Fremantle port to refuel, before Australian authorities made a decision on how to proceed in cooperation with Malaysia and international air safety authorities. KELLER, Texas - The family of a North Texas man who was aboard Malaysia Airlines Flight 370 is coming to grips with Malaysia's announcement that the missing plane crashed in the southern Indian Ocean with no hope of survivors. Philip Wood was one of three Americans on board the flight, which disappeared March 8 while en route from Kuala Lumpur, Malaysia, to Beijing. The other two U.S. citizens have been identified as Nicole Meng, 4, and 2-year-old Yan Zhang. Wood, an IBM executive, had been living in Beijing and was planning to relocate to the Malaysian capital with his girlfriend, Sarah Bajc. He had two sons, one a recent graduate of Texas A&M University and the other a sophomore there. Bajc said in an email that she was disturbed that no confirmed wreckage has been found, but that Malaysian Prime Minister Najib Razak's announcement was allowing her to begin to grieve after an agonizing, 17-day wait. "I need closure to be certain but cannot keep on with public efforts against all odds. I STILL feel his presence, so perhaps it was his soul all along," she wrote. "It looks like the first phase of our mission has ended. Now Philip's family and I will need some time for private grief." In Texas, Wood's younger brother told CBS station KTVT that the family is accepting the sad news and relying on their Christian faith to help them through their grief. He said the family will not travel overseas and is instead planning a local memorial service for Philip Wood. After Flight 370 disappeared, the family set up a Facebook page titled "Finding Philip Wood," which has been flooded with messages of support. In a post Monday, the family said: "Our collective hearts are hurting now. Please lift all the loved ones of MH370 with your good thoughts and prayers. Thank you for your continued support and for being our inspiration." Wood's family told CBS Dallas that if there is anything good to came out of this tragedy, it's the kindness of people -- even strangers -- during such a tough time. The family says they hope the plane's black box is recovered so that they can learn more about what happened during the flight's final minutes. Police yelling now. #MH370 protest coming. Police pushing us & others down closed street. This appears organized/sanctioned. #MH370 families getting near Malaysia embassy on foot. #MH370 families now beyond barricade and lines of guards. Media not allowed. Protestors carrying placards & chanting. Rare sight in China. 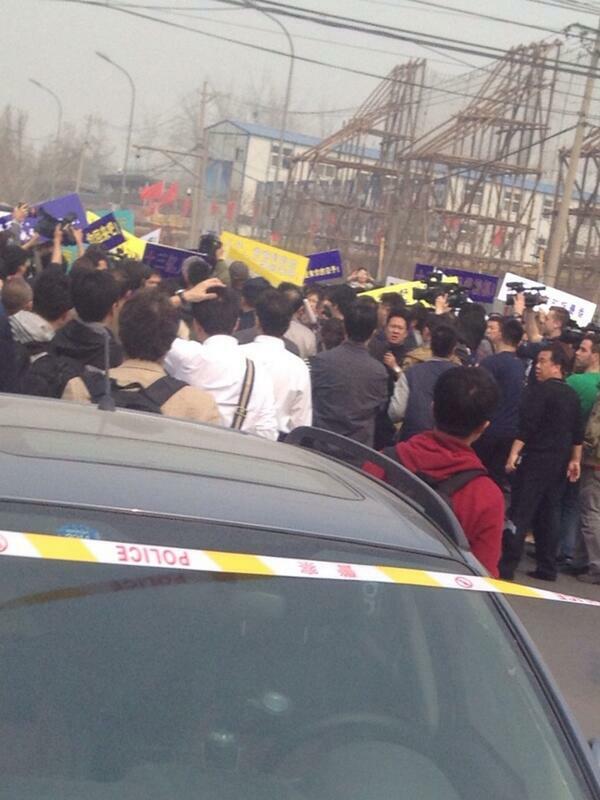 #MH370 families chanting for Malaysian diplomats to come out and face them. More police heading to area cordoned off for protest. 04.20 Defence minister David Johnston is speaking in Perth thanking crews and teams involved in the search. "This is an amazing example of international cooperation especially between militaries," he says. But he has reiterated that there has been no physical confirmation that the items spotted in the sea relate to the missing plane. "Until we recover and positively identify a piece of debris, everything is speculation." Some #MH370 relatives now in media throng. Police pulling some cameramen away. Now a stretcher with woman being wheeled past. As #MH370 families protest in Beijing, Malaysia Airlines says the recovery process of plane's wreckage "may be even more complex”. 04.35 Malaysian authorities are now giving a press conference in Kuala Lumpur, defending the way in which they broke news that the flight was now considered to be lost to the families of passengers. The Malaysia Airlines group chief executive said text messages were used "as a last resort". He goes on to detail how 900 relatives are being supported by the airline, including financial assistance. "We don't know why, we don't know how this terrbile tragedy happened, but the Malaysia Airlines family are all praying for the passengers and crew of MH370." 04.26 Air Marshal Mark Binskin, vice chief of the defence force, says he hopes the weather will improve in the coming days. "This is a highly complex search, it will develop in the coming days." A lot of media but far more police. 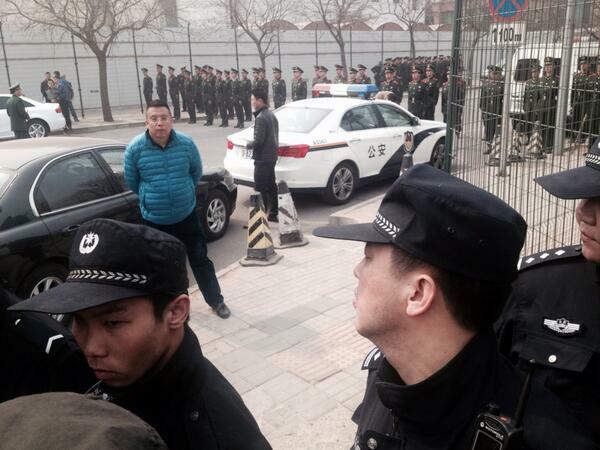 Everyone pushed back as some #MH370 relatives wade into throng near Malaysia embassy in Beijing. KUALA LUMPUR, Malaysia — The Malaysian authorities released new details on Tuesday of the last satellite communications by Malaysia Airlines Flight 370, even as furious family members and friends of the plane’s passengers broke through police lines in Beijing and marched to the Malaysian Embassy. Now, that principle expounded by Austrian physicist Christian Doppler – that frequency rises when the source is moving closer and falls when it’s moving away – has been used for the first time to determine where Malaysia Airlines3786.KU -2.13% Flight 370 went. All modern aircraft are able to communicate with ground stations via satellite. If the ground station doesn’t hear from an aircraft for an hour, it transmits a “log on/log off” message, sometimes referred to as a “ping,” using the plane’s unique identifier. If the aircraft receives the identifier, it returns a short message indicating that it is still logged on. This process is described as a “handshake” and takes place automatically. As the position of the satellite is known, the time that it takes the signal to be sent and received via the satellite to the ground station can be used to establish the distance of the aircraft from the satellite. Such information was used to generate two arcs of possible positions from which investigators established that the missing Malaysia Airlines plane flew along either a northern corridor from Thailand and into Central Asia, or on a southern corridor that stretches from Indonesia to the southern Indian Ocean. From the ground station log, it was found that after a key communication equipment onboard Flight 370 stopped sending messages less than an hour after it departed Kuala Lumpur, six complete satellite handshakes took place, Hishammuddin Hussein, Malaysia’s acting transport minister said Tuesday. In the last few days, satellite firm Inmarsat used the Doppler effect to analyze the difference between the frequency that the ground station expected to receive and what was actually measured. The technique is called “burst frequency offset” that changes depending on the location of the aircraft on an arc of possible positions, its direction of travel, and its speed. The captain of Flight 370 was in no state of mind to fly the day it disappeared and could have taken the Boeing 777 for a "last joyride" before crashing into the Indian Ocean, a fellow pilot says. The man, who spoke to the Herald on condition of anonymity, said Captain Zaharie was "terribly upset" when his wife told him she was leaving and believed he may have decided to take the Malaysia Airlines plane to a part of the world he had never flown in. Investigators revealed that eight minutes after the last complete transmission from Malaysia Airlines 3786.KU -2.13% Flight 370, there was a "partial ping" from the missing aircraft that could help investigators unravel what happened to the missing jet before it stopped flying. The final partial transmission from the missing Boeing Co. BA +0.49% 777-200ER, which disappeared from civilian radar on March 8, "originates with the aircraft for reasons not understood," said Chris McLaughlin, senior vice president of Inmarsat ISAT.LN +0.07% PLC, which operates the satellite. The company is investigating the partial ping—or digital handshake between the jet and the satellite—as "a failed login" to its satellite network or as "potential attempt by the system [aboard the aircraft] to reset itself," Mr. McLaughlin said. The partial ping could have several possible explanations, he added, but that human interaction with the satellite communications system had been ruled out. Officials at Austin-based Freescale Semiconductor Ltd. had no public response Monday to new reports that it appears the missing Malaysia Airlines plane carrying 20 Freescale employees likely crashed into the Indian Ocean, killing all aboard. Freescale previously confirmed that the 20 employees — 12 from Malaysia and eight from China — were among 239 people on flight MH370. Earlier this month, Mitch Haws, Freescale’s vice president, global communications and investor relations, said the employees came from a range of disciplines and were part of a broad push by CEO Gregg Lowe to make Freescale more efficient and cost-effective. While the employees on the flight account for less than 1 percent of Freescale’s global workforce of close to 17,000, they were working toward the same goals, and their loss will reverberate throughout Freescale, Haws said. SYDNEY—A search party comprising 11 aircraft and five ships readied to hunt for Malaysia Airlines Flight 370 on Thursday, as bad weather closed in on an area of the southern Indian Ocean where a possible debris field was spotted by a satellite. The satellite images, provided by a division of Airbus Group, were taken Sunday and appear to show 122 objects in an area of 400 square kilometers (160 square miles) in a part of the ocean where a multinational operation is under way to find evidence of the jet more than two weeks after it vanished from radar. The Australia Maritime Safety Authority, which is coordinating the search, said positions in the satellite images were within the area scoured on Wednesday, around 2,500 kilometers (1,550 miles) southwest of the western Australian city of Perth. In a statement, AMSA said military aircraft from the U.S., Japan and Australia would join five civil aircraft to take part in the hunt for the missing Boeing 777-200 plane on Thursday. “Weather in the search area is expected to deteriorate later today,” AMSA said. SOUTHERN INDIAN OCEAN — The Royal Australian Air Force P3 Orion, led by Captain Michael MacSween, burst through the cloud bank into the Malaysia Airlines search area on Thursday to be confronted by a wild, squalling, leaden expanse of sea covered by frothy waves disappearing into milky fog. In the crowded cockpit, an elite anti-submarine squadron with decades of experience spotting objects in the sea showed how even seasoned professionals are struggling to find debris in the hunt for Malaysia Flight 370–defying hope generated by new satellite imagery. Images taken from a Thai satellite and revealed on Thursday showed 300 objects in floating in the ocean near the MH370 search area, according to the country’s space technology agency. On Wednesday other images provided by a division of Airbus Group appeared to show 122 objects in one of the search areas. Hope faded after almost two hours as the radar blips stopped and the sea continued to boil. Minutes later, the Australian Maritime Safety Authority called the search off for the day due to bad weather.